One of the surprising, and surprisingly last-minute, updates ot the SharePoint Conference 2014 roster was the announcement of Bill Clinton's keynote address. As a former president with a strong track record on economic policies, Clinton's address spoke to the value of enterprise content management in a troubled job market. His address didn't stop there, however. Clinton was speaking on behalf of the Clinton Foundation, a charitable organization that works to support economic growth, environmental sustainability, and other business ethics pursuits around the world. The value of economic growth was a major point of his keynote, and he noted that one fifth of the economic growth during his administration was due to technological advances. He also went beyond pure economics, however, emphasizing that technology had a vital role to play in making a better world—so long as we use that technology appropriately. "Technology is liberating people, empowering them, but how they use it, and how you use it, depends in no small measure on identity," said Clinton. "And whether what we have in common is more important than our interesting differences." Clinton then went on to discuss ways that technology like SharePoint could make the world better. 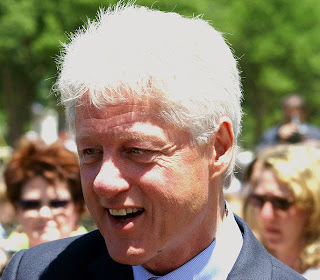 Among other examples Clinton provided was the earthquake in Haiti (2010), and the ways that technology allowed for more rapid and effective disaster response. Clinton asked some hard questions. "As we look at the 21st century world," he asked, "what do you think is wrong with it, and how do you want it to come out? How do you think about what you'd like the world to look like when you have children your age?" He warned of the risk of trying to push past the cutting edge, and the ways that technology can be used blindly and without regard for its more unsettling consequences. He further discussed how technology like SharePoint could help move the 21st century toward the sort of world he values. "Not one in which we erase our interesting differences, but one in which we recognize that our community humanity matters more," he stated. "And unless we act as if it matters more, we will never be able to preserve many of those differences."